Chinese New Year is a time of enjoying many delicious foods and snacks. 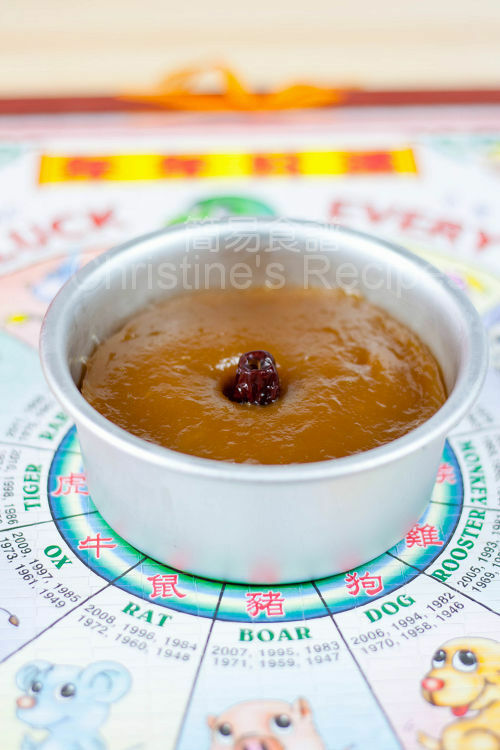 One of popular desserts eaten during this festive season is Chinese New Year’s cake (nian gao 年糕), that made with sticky, glutinous rice flour (mochi flour) with brown sugar because it’s symbolic of growing taller, achieving higher every year, that signifies a prosperous year awaiting ahead. It’s often served warm as it is. However, in Hong Kong, people like to have the steamed sticky rice cake, sliced and then pan-fried with egg. If it's pan-fried without egg, the texture would be slightly crispy outside and still pasty inside. When some relatives or friends come to visit them (bai nian拜年), they’d serve the sticky cake warm, with some other snacks, like turnip cake and taro cake. Update: If you have an electric pressure cooker, Instant Pot, you might like to take a look at this radish recipe with video tutorial. Use a saucepan to bring 1 cup of water to boil. Add brown sugar and cook until completely dissolved. Stir in coconut cream and oil. Drain syrup through a fine sieve to make the mixture smoother. Let cool. Sift glutinous rice flour and wheat flour twice beforehand. Add flour bit by bit into syrup, stir constantly along the way, and combine well. If you'd like your batter really smooth, drain through a fine sieve once more. Transfer batter to a greased cake mould. Place in a wok and steam over high heat, covered, for about 60 to 75 minutes. As the cake is very sticky, even if it’s cooked through, it still sticks to your needle/chopstick if you test it. But if you can’t taste any raw flour, it’s done. Make sure to steam the cake for enough time. Let cool. Refrigerate for at least 3 hours. When the cake is cold, it’s much easier to slice into thick pieces. Coat the sliced cake with whisked egg, fry on medium-low heat until both sides are brown. Serve hot. The time of steaming cake depends on how big and thick your cake is. I followed the traditional way of decorating the cake and inserted a date in the middle, after steaming 15 minutes or so when the surface is slightly set. This cake sounds divine! I haven't quite had anything like this and would love to try it! This is very interesting. I always want to know how to make CNY cake. Thanks for sharing the recipe. Yeah....my favourite. My family loves it very much. We also like it fried with a little egg. I think we used to call this tikoy in the Philippines - it was delicious - we usually sprinkle as well with sugar... is that the same one? Yum! Thanks for sharing the recipe. We use to eat it warm coated with shredded coconut....very delicious. This cake sounds delicious and is so different than anything I've prepared before I am so intrigued. Cannot wait to give it a try. Thanks for sharing. My favourite!! love it fried! Thanks for sharing this fabulous recipe! I've always wondered how they were made... Can you use regular rice flour for this recipe? Also is that coconut milk or cream? I used to have the recipe for this, but lost it over the years. Thanks! Btw, can I substitute the coconut cream with something else or not use it altogether? My bf's mom is allergic to coconut..
wow, you made your own. We just bought ours. haha. We usually pan-fry them coated with egg. Looks really good! I have gotta try too but I will have to skip the coconut milk and I prefer it plain. I suppose i can substitute with water? Thanks again for such a great website!! Great photo! I love the idea of the steamed bread. Yum! I haven't had chinese new year cake for since...last chinese new year! I've never had them fried with egg- my mum usually just fried them for us. But it tastes great anyway! Next time, I'll definitely try the egg- it looks so good! Love your recipes. 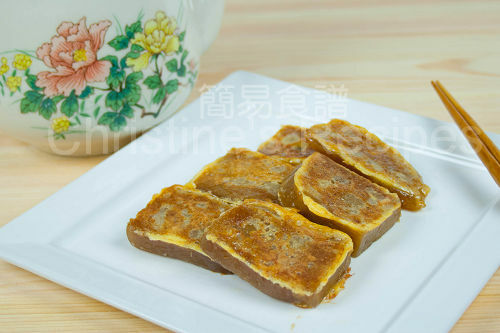 Do you have a recipe for 千層糕, chinese layers cake? Thanks. Almost CNY ^^ I'd love to try this recipe, but I can't find any wheat flour in my area. Any suggestion for a substitute? Or is glutinous rice flour enough? Thanks! You can skip the wheat flour if you can't any. The texture would be a bit different. It's fine for the taste though. I tried your recipe yesterday! I used regular wheat flour (other than the traditional chinese one ), it tastes really good! But the surface of the cake looks horrible. it is not as smooth as yours. It is because of the steaming water dripping to the cake? or I really have to use the real chinese wheat flour? Did your cake surface look smooth before putting in the wok to steam? It could be the water condensed on the surface. Brush a bit of oil at the back of a teaspoon, the use it the smooth the surface of your cake before steaming next time. To prevent water condensed on the surface, place a wax paper on top. Made some yesterday, and it's delicious! ^^ I have a question though: when cooled down and refridgerated a few hours, is it supposed to be still soft (although less sticky and easier to slice) The sticky rice cakes others bring me are usually hard, mine was not. Just wondering =). Thx for this recipe! It was so easy to make, this one's a keeper! You made a wonderfully good CNY cake with a nice texture, still soft but easy to slice. The less water contained in the cake, the harder it becomes after chilled in fridge. I've made this today, but after 2hours of steaming, I still can taste raw flour and the inside of the cake is still more pale than the outer side. My cake is only 1 inch thick.. I'm confused, is it cooked enough? 2 hours of steaming? Normally, it should be cooked through. I'm also confused by what you said here. I made it today and wish the recipe was in ounces and not grams. I used whole wheat pastry flour in place of whole wheat flour. It tasted good but had to make another cake because the 5 inch round was too small. hey there, i made this recipe few weeks back and the nian gao isn't sticky at all :( it taste v solid and abit powdery. i follow the exact measurements. Oh well, guess the texture problem was not because of the cooking time. Just wondering if you're sure the measurements were correct, or added the right flours or not. Coconut cream is thicker and richer than the coconut milk. Have you tried to steam this in the Instant Pot? Yes, I tried to make this cake in my Instant Pot and posted the recipe on my Chinese blog there. Hi Christine, I enjoy your recipes very much especially the chiffon cakes. I'm curious if the sticky rice cake can be baked in the oven. Would it come out dry? I'd like to make several and the oven allows me to do more than just a wok. Thank you Christine! This traditional sticky rice cake can't be baked in an oven. It only can be steamed in a wok or steamer.